First impressions: I was travelling with colleagues. We arrived at Kuala Lumpur International Airport at 0800 for the 1005 departure on MH004. There was no queue at the premium check-in and since I had baggage only, I picked up my boarding card and went through fast security. There are two parts to this – a quick check before entering the airport duty free area, then you take the shuttle across to the satellite terminal from where the UK flights on MAS depart, and just before the gate there is another security check. The business class lounge is accessed after the first check and the shuttle train across to the satellite and before this final security check. To find the lounge, as you depart the shuttle train take the escalator up to the first floor level. For a review of this, click here. Boarding: The flight was called from the lounge at 0935 and we made the short walk down to the gate. There was a premium line and then a separate air bridge for premium passengers. Once on board we were offered a choice of soft drinks and our jackets were taken. The seating configuration is 12 First Class seats in the nose of the aircraft, and then 41 business class seats in a very strange configuration of one cabin of 11 seats (rows 17 AC-DFG-HK and 18 AC- HK) and then four seats to one side of the stairs and the galley in pairs 19AC and 20AC). Then there are the seats on the upper deck in a AC-HK configuration. For a seat plan, click here. Best seats: Clearly you should go for the upper deck. It is quieter, dedicated to business class passengers, and good for sleeping because quieter. The main deck is slightly noisier since you have washrooms in front of you and the galley behind. The centre row has three seats, so avoid the middle one. A colleague was sitting in the main deck cabin in seat 18A, and he had water dripping on him from the air conditioning before take off until some paper towels were jammed into the gap above his head. Worst of all, however, are the four seats of rows 19 and 20. Of these, 19C is probably the worst of all, since there is no storage space, you are knocked and disturbed by the passengers coming onto the aircraft, and have the galley to your side, though this is screened off by a blue curtain that is pulled across for most of the flight. There is also a small overhead compartment here where the crew keep the magazines, and these can fall on you when they open it. Service begins in the front cabin on the main deck with row 17, then comes through to row 19 and 20 (AC). We set off at around 1045am and got drinks at 1115, which was quite slow. Nevertheless, in general I thought the service was of a very high standard. Shortly after take off we were given a Clarins amenity bag with a few essentials in and I asked for an eye mask and ear plugs so I could sleep later. The flight: Malaysia puts a lot of effort into its food and both on this flight and the earlier one on the A380 I was impressed by the quality. The meals always seems to start with an appetizer of Malaysian satay – charcoal grilled chicken and beef skewers with peanut sauce and traditional accompaniments, or Salmon gravlax and citrus glazed prawn with salad and a wedge of lime. Assuming you have no dietary restricions, choose the satay which are delicious. Main course: Braised lamb shank with broad bean mashed potato, seasonal vegetables and rosemary sauce or pan fried silver cod with saffron potatoes, seasonal vegetables and basil cream sauce or stir fried beef in ginger, garlic and dried chilli cooked in soya and oyster sauce with e-fu noodles and mixed vegetables. Dessert: Tiramisu garnished with strawberry half, fresh fruits or ice cream. White wines: Domaine Zind-Humbrecht Riseling Herrenweg de Turckheim 2008; Olivier Leflaive Bourgogne Chardonnay 2009. I slept for about three hours and found the seat pretty comfortable in the fully reclined position, though this is a lie flat type rather than fully flat, so you do keep slipping down the seat. I then watched a few films – the IFE is AVOD and there was a pretty wide choice, though not much that I wanted to see in terms of recent films. I then worked using the in-seat power. The table was good and firm, and reached across to rest on the side arm – a traditional and good design. Before landing we had a “Light meal” choice, although disappointingly, two of the main courses had run out by the time we were offered our choice. The appetizer was smoked chicken breast with chives potato salad and fresh mango. The main course was prawn Langkawi: prawn cooked in light gravy with steamed rice and sautéed mixed vegetables with mustard seeds or Malabar mutton curry with basmathi ghee rice, cabbage and lentil kootu and cauliflower pakoda. The two choices which had run out were honey grilled chicken with roasted potatoes, seasonal vegetables and mustard sauce and the “light choice” of mushroom ravioli pasta with sweet tomato basil sauce and parmesan cheese. The airline has a wide choices of teas and coffees, including some speciality ones such as Brazilian Santos and Ethiopian Yirgacheffe as well as Nespresso Grands Crus Blands such as Roma and Volluto. The teas included two types of green tea, Earl Grey, Oolong and Rooibos. Arrival: we arrived over half an hour early at London Heathrow, flying straight in without any holding. There was no queue at immigration, and so I was on an underground train within 15 minutes of landing. Verdict: there’s nothing really wrong with this business class, but it is old and can’t compete with the business class of airlines such as Singapore Airlines on routes back into Europe. 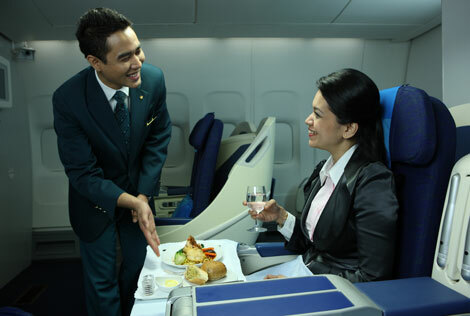 The aircraft – and the product onboard – are gradually being replaced, but in the meantime if the price is right, the onboard service and food may persuade you to fly. All change for the end of the year however with A380s on the route and also down to Sydney, and Malaysia Airlines joining Oneworld.